AFM-nDMA is a new AFM mode for viscoelastic measurements tied directly to bulk DMA (Dynamic Mechanical Analysis) – for the first time! 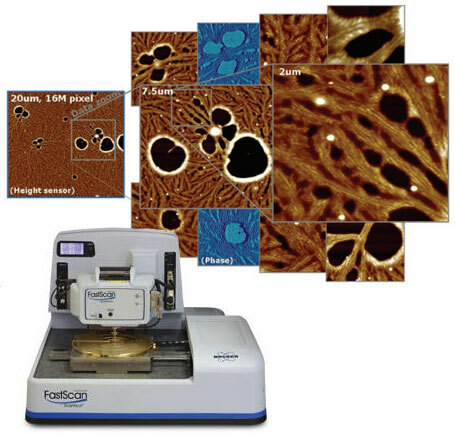 AFM-nDMA is a new AFM mode for Bruker Dimension atomic force microscopes. For the first time, you can now perform nanoscale viscoelastic measurements that match bulk dynamic mechanical analysis (DMA). This works over the entire frequency range that’s typical in bulk rheological measurements. AFM-nDMA storage modulus map of quaternary blend. Quantitative data at rheological frequencies for every pixel. How do nanoscale phases differ from bulk? What are viscoelastic properties near the interface or in an interphase? How does this affect load transfer, as a function of temperature? Previously these areas have been difficult to research, because of the challenges in making nanoscale viscoelastic measurements. AFM has traditionally been disadvantaged by non-linearities, irrelevant frequencies, unaccounted effects of adhesion and the need to recalibrate results. Now, AFM-nDMA overcomes these problems, with data that directly matches results from bulk DMA and indenter-based nano-DMA. We can now quantify local viscoelasticity at relevant frequencies and length scales that relate nanoscale properties to bulk performance. This addresses a significant unmet need for industrial polymer characterisation. 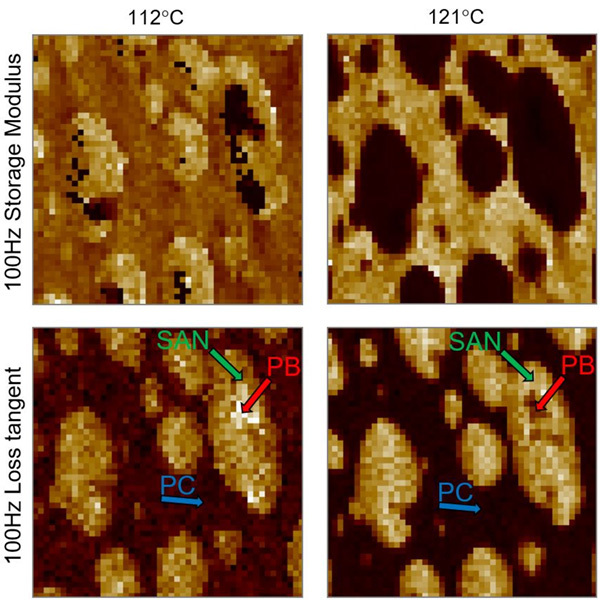 Thermoplastic PC-ABS: AFM-nDMA reveals and quantifies significant changes in local viscoelastic properties at various temperatures. 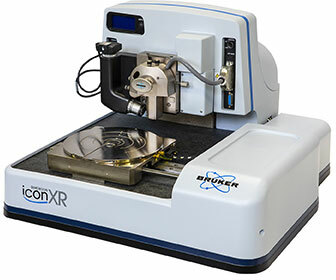 This gives you the ability to study polymer rheology at the nanoscale – which expands the applications of AFM into new areas. Bruker’s AFM-nDMA is the first commercial solution for quantifying viscoelasticity at the spatial scales of AFM. Having pioneered nanoscale rheological measurements, I am very excited to see this important capability become widely available. Extreme Research series for nanomechanics, nanoelectrical and nanoelectrochemical characterisation. Flexible AFM with the widest range of modes, also suitable for large samples. The world’s fastest AFM: immediate, high resolution images. AFM-nDMA reflects our long-standing commitment to provide quantitative and easy-to-use nanomechanical characterisation. From the invention of TappingMode to PeakForce Tapping and now AFM-nDMA, we have consistently led this charge, and we are very eager to see the use of atomic force microscopy growing with quantitative viscoelastic characterisation.